Celebrate the amazing Fathers in your life at Noble Ridge on Sunday June 16th! Join us for our annual Stampede Breakfast. 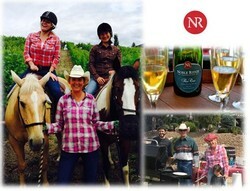 Enjoy a traditional pancake breakfast cooked by our Winemaker & Owners Jim and Leslie with our signature Mimosa, wine tasting, horseback riding in the vines, Country music and line-dancing. This event is great for all ages. Bring the family and enjoy the stunning view, great company, delicious food and wine! Country attire is highly encouraged, so dust off that hat and shine those boots!